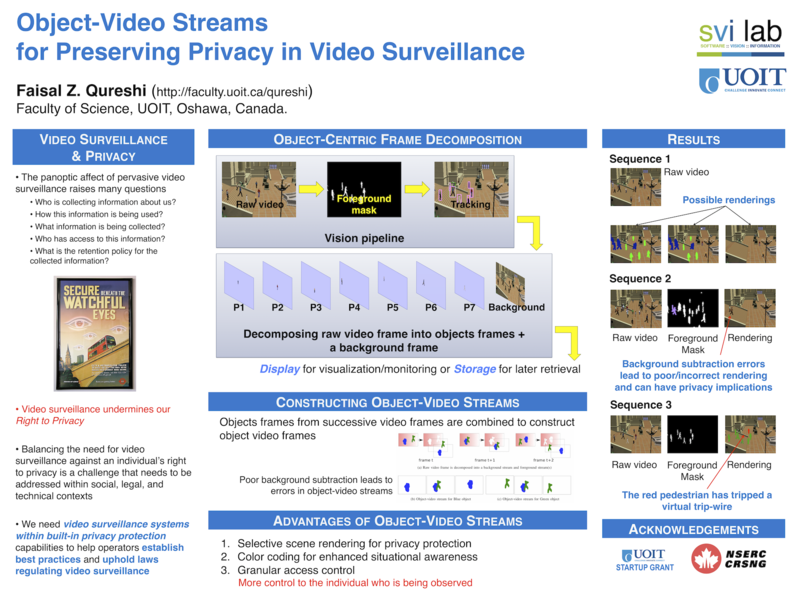 We presents a framework for preserving privacy in video surveillance. Raw video is decomposed into a background and one or more object-video streams. Objectvideo streams can be combined to render the scene in a variety of ways: 1) The original video can be reconstructed from object-video streams without any data loss; 2) individuals in the scene can be represented as blobs, obscuring their identities; 3) foreground objects can be color coded to convey subtle scene information to the operator, again without revealing the identities of the individuals present in the scene; 4) the scene can be partially rendered, i.e., revealing the identities of some individuals, while preserving the anonymity of others. We evaluate our approach in a virtual train station environment populated by autonomous, lifelike virtual pedestrians.